Lake Creek is another very popular fly fishing destination in Alaska. People come to the various rivers from all over the world to catch the large Salmon that run these rivers each year. The Fly fishing can be amazing during these runs, and the season is short so you need to plan your trip early while fly-fishing guides and lodges are still available. 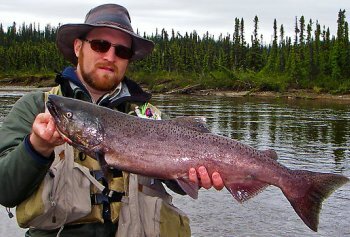 Lake Creek is one of the premier fly fishing destinations in Alaska. Combined with all the surrounding streams this area really has a lot to offer. Located near Anchorage many anglers can hit this in a one-day trip. To get where the large populations of fish are you will have to do a bit more. You will need to travel much further upstream to some of the remote areas to find the most fish. The King Salmon start things off in June with a great run. They are followed by Chum Salmon and Pink Salmon in July. Lastly the Coho finish things off in late July and early August. The best time to go after the Trophy Trout is in August as these fish find all the spawning salmon that have returned to spawn. You will also find Arctic Grayling in these waters as they migrate in spring and fall. Like other streams in Alaska your biggest Trout and Grayling will be caught after they have gorged themselves on all the salmon eggs. The King Salmon get most of the attention, and why not when you can hook a 50 pound fish on a fly. These fish can be caught from the shore or by wading through the gravel beds. The water is typically higher and running fast when the Kings are around so it will require heavier gear like a 10 weight or more. The Silvers, Chums and Pinks arrive after the water has leveled and slowed some. They tend to pool up in some of the deeper sections or in the backwater pools. All of these salmon are known to take a dry fly as well as poppers. The Pinks don’t require much more than a bare hook to catch them. While there are some areas to walk and wade much of the river will require a boat to be fished best. These waters are not for the beginner either, there are some class II, class III and class IV water on this creek and one mistake could be your last. A local fly-fishing guide can get you on the water within an hour from Anchorage so you may want to explore that angle. Leave this Lake Creek page and go to Alaska page.